features primarily our unique and patented See-Thru Guillotine. You'll see a demonstration and many of its construction features pointed out. In addition, two other guillotines are shown, the Lester Lake Head Chopper and the 7 foot tall Monster Guillotine in which the head is seen to fall off. Also on this tape is a demonstration of the Magic Switchboard -110 volt version. 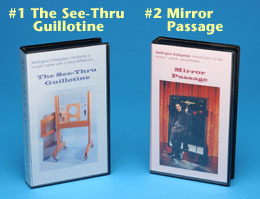 features a demonstration of the Mirror Passage illusion by its inventor, Luis DeMatos. The construction features of this illusion are also shown. Other demonstrations on this video include the Floating Table, and two items from our Signature Series - the Mini-Magic Switchboard and Mark Settiducati's Guardian of the Grave. Each tape is $14.95 postpaid in the U.S. Foreign orders $19.95 includes air mail delivery. Please specify NTSC or PAL.